Holman Plumbing and Water Treatment provides well pump, water filtration, and rainwater harvesting services - we also install products like reverse osmosis systems in your home or business. Reverse osmosis is a process that has been studied and used since the year 1748. It has been developed to a point that it is useful in creating a source of drinking water. Our team installs and maintains these systems throughout Vancouver Island and the surrounding islands. Reverse osmosis systems are different that water filters. Ordinary water filters use a screen to separate only particles of dirt and sediment from the raw water source. Reverse osmosis employs a semi-permeable membrane that removes not only particles but also a very high percentage of dissolved contaminants, molecule by molecule, from your raw tap water. Your system will deliver pure, bottled water quality water to a faucet conveniently located at your kitchen sink or any other designated area. A process that is similar to reverse osmosis, but with some important differences, is the Ultra Filtration System. When you need water filtration in your home, it is good to know the basics of both. 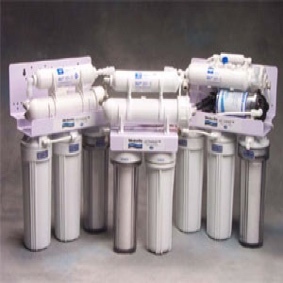 Reverse osmosis systems remove much smaller particles than ultra filtration (UF) systems. However, UF has significantly less waste water, is much less expensive, and has far better flow rates at a lower price point. Visit our contact page to give us a call, text, or email. We're happy to answer your questions! Now with our new water system there has been a tremendous change. Most importantly we are healthier, the water tastes and smells like water again and not some chemical cocktail, also the skin problems have been reduced to minimal. Our hair and skin is soft and we use less body and house hold products. It was so nice to meet a professional who is certified and cares about clients needs. Thank you so much Lauren! You have restored my faith in the concept of living up to one’s word. As a result our drinking water was limited to the designated R.0. tap in the kitchen; however, with no way to monitor the efficiency of the filters we were never certain that our drinking water was safe. I am sure we will enjoy a long and stress-free relationship with you. I'm really happy with the work you did for me, the faucet installation and cut off valves on the pipes as well as my new pump. I am especially pleased with the Pentex pump saver. As you know, I was everywhere with my camera that day, so I captured most of what you were doing and attach the pictures as a reminder of a job well done. Thank you very much for replacing my pump in the correct fashion, and showing me the errors a previous well service company had made.